I’ve been a Green Party member since 1977, and stood in two national and a few local elections in Sussex between 1979 and 1999. 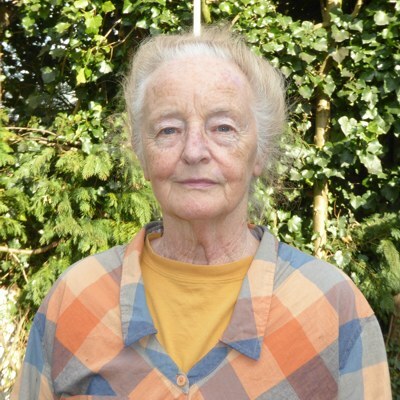 I moved to North Pickenham in April 2012 from my smallholding in Devon (where I’d 'retired' in 2000), to be nearer to my daughter and small grandchildren. Coming from 15 acres of remote countryside to about 1/6 acre in a village was quite a change! I’d never lived in a village before, but have found a welcoming atmosphere, made many friends and become active in village life, and now feel I know the area sufficiently well to be an effective local councillor. My interests lie in human relations and social responsibility as well as environmental and countryside issues. One useful skill I brought with me is hedgelaying - the drive up to my local church looks a bit better than it did when I arrived! 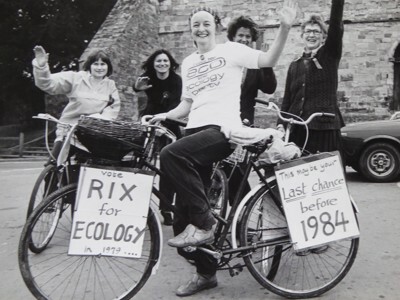 During the campaign, we had done a 'round the constituency bicycle ride' starting in Heathfield (where I lived) about 6 am, having breakfast with an Eco member in Rye, then along the coast to Bexhill (where I think we had lunch), and back to Heathfield. About 60 miles in all (and no gears on the bike!). The photo was taken outside Battle Abbey. The constituency boundaries were changed before the 1983 election, when I stood in Bexhill & Battle.